Affinity purified against GST-RNF7 [DU 21923] and then depleted against GST. 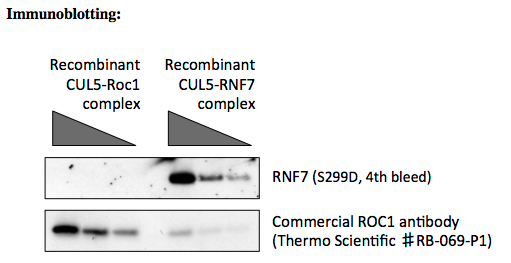 RNF7 antibody detects RNF7 protein expressed in insect cells without cross-reacting with the closely related Roc1 protein. 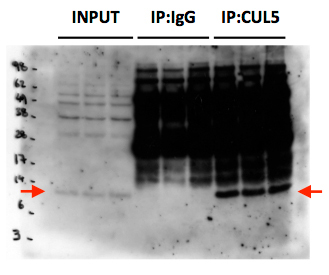 RNF7 is immunoprecipitated from 1 mg of HEK293 cell extract using 20 ug of antibody non-covalently coupled to protein-G-Sepharose. 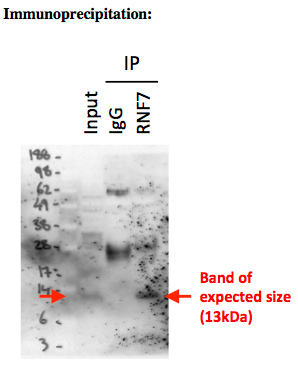 Band of correct size is detected for RNF7 after immunoprecipitation of CUL5 from HEK293 cell lysate.